The B-57 Canberra was the first jet-powered American attack aircraft committed to the Vietnam War. Involved in day-to-day interdiction missions as well as in classified black missions and a starring role in Operation Rolling Thunder; the B-57 evolved to become one of the most valuable weapons in the USAF inventory. The B-57E was involved in the Patricia Lynn missions, parts of which remain class… ified. This book also fully documents the role of the Australian Canberra B-20 in working alongside the B-57. 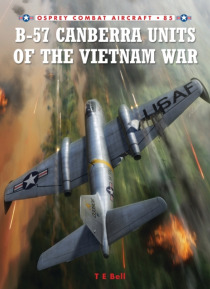 Featuring scores of previously unpublished photographs; the story of the B-57 is the story of the Vietnam War.